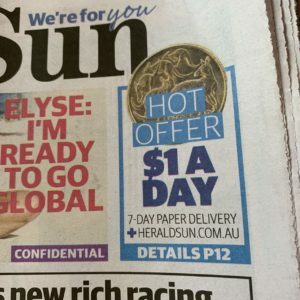 The ad placed in a perfect position on the front page of the Herald Sun yesterday pitched a campaign aimed at cutting the daily visit to the newsagent, or any other retailer, to buy the newspaper. It pitched a $1 a day home delivery, an offer that must be loss making for the company. An offer that makes buying the newspaper at retail look expensive. There was a time these pitches were done with a stuck on ad, which we could remove. No more. Here is the pitch from page 12 of the newspaper. $1 a day for six months. That sounds like a deal too good to pass up since for the cost of four week day over the counter purchases you get seven days home delivered. Newsagents need to be aware of this latest pitch from News Corp. They should factor it into consideration abut the future role of newspapers in their businesses. News is making its focus clear, it is investing in home delivery as the loss leader, making it more appealing than over the counter. The thing is though, home delivery has to be managed by the customer. If they are away they have to deal with that,. If the paper does not come, they have to deal with that. If the paper is in the wrong place, they have to deal with that. If the paper is late, they have to deal with that. The world today, when it comes to accessing news, comment and analysis, is spoilt with convenience. On our phones and tablets we have easy access to multiple news platforms, subscription and free. Why sign up for something with out of date content, that is hard to navigate, that results in trash and that often represents only one view of the world? The price tells us that there is not much faith in the content and convenience offer within the company. The core issue for newspapers, in my opinion, is the medium. The print medium for news is out of date, inefficient, bad for the environment and cumbersome. We have moved,. I certainly have moved on. The only time I engage with a print newspaper now is at a coffee shop when waiting for my coffee and even then its is rare. The pay walls don’t get me subscribing. Occasionally, there is a Media story in The Australian behind a pay wall that I want to read, but I will not sing up to a subscription to access them, because doing so gives me access to so much trash. I subscribe to support good journalism. As I wrote almost two years ago, I have subscribed to The Washing Post, The New York Times and The Age. I have also supported several digital news platforms. With a such a negative view of newspapers as expressed and no matter how correct your view of the future of newspapers might be (only time will tell), it might be time to change the name of this blog!! The name is increasingly misleading as regards content! !